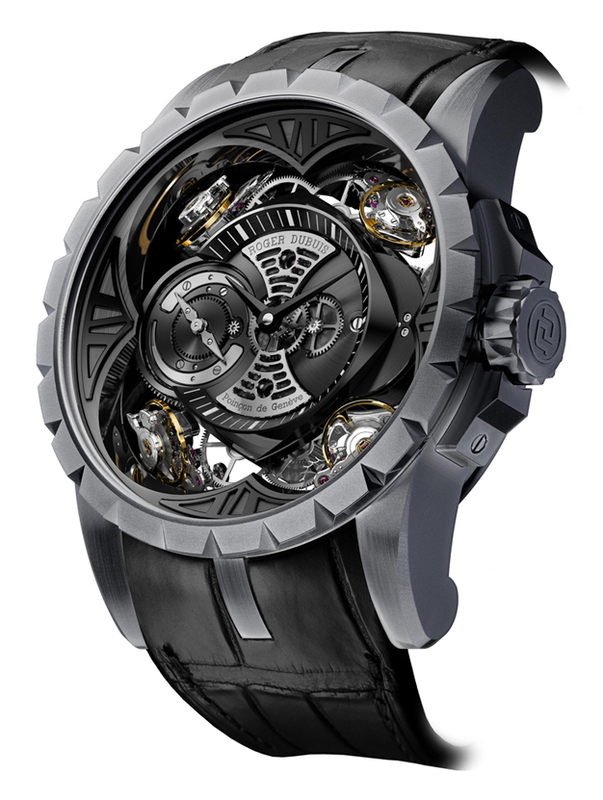 Excalibur Quatuor: this is the name chosen by Roger Dubuis for the world’s first silicon watch incorporating four sprung balances, the result of a seven year research program. Silicon has been chosen for its uniquely low weight and its incomparable hardness. In fact, it is half the weight of titanium, which is half the weight of steel, yet it is 4 times harder. 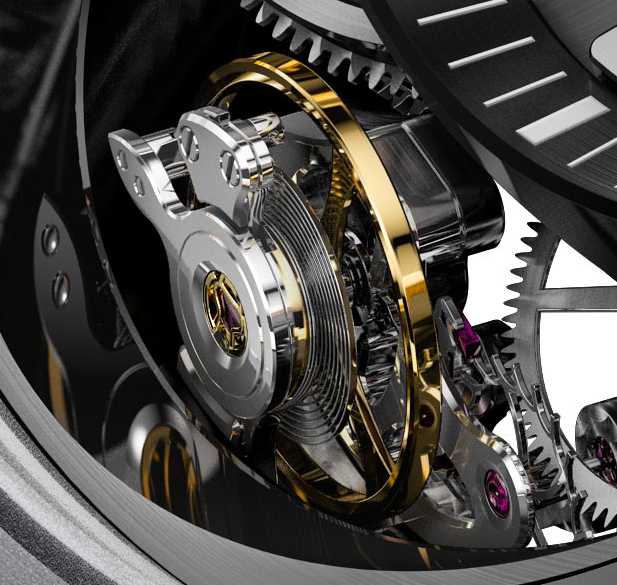 The regulating organ, or sprung balance, is the pulse of a mechanical watch, the critical component that has always attracted most attention. 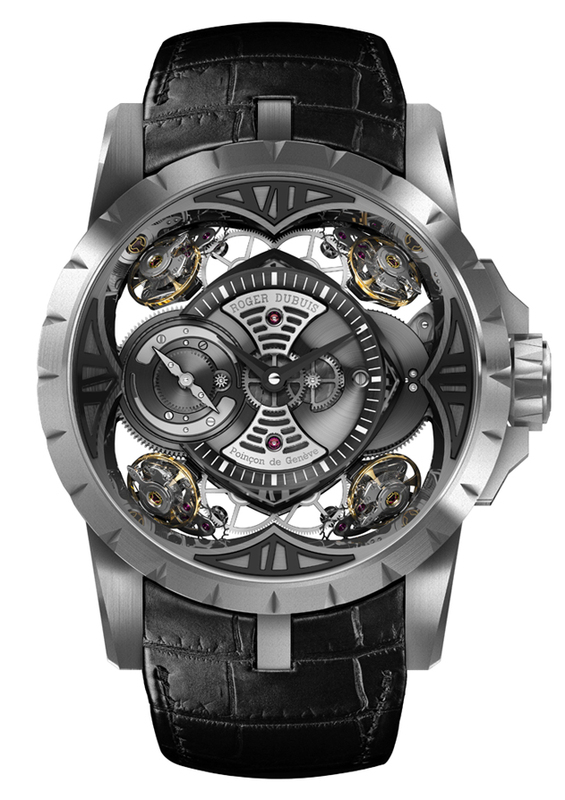 The Excalibur Quatuor incorporates not just one but four sprung balances in the same movement, the calibre RD101. A feature that was considered impossible until now and that have been developed to achieve new heights in terms of precision. As most readers know, precision is affected by the gravity of the Earth. 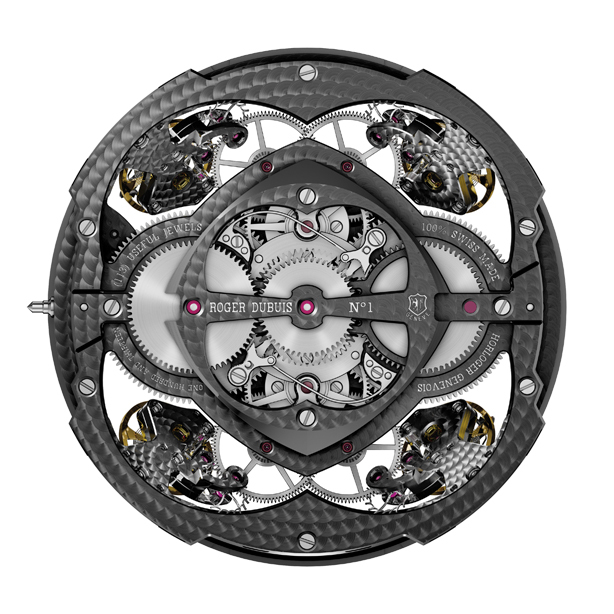 The tourbillon provides a partial solution by compensating the rate variations in the course of a minute. Instead, the Excalibur Quatuor performs this compensation instantly thanks to the four sprung balances. The Excalibur Quatuor operates at a very high frequency of 16 Hz. 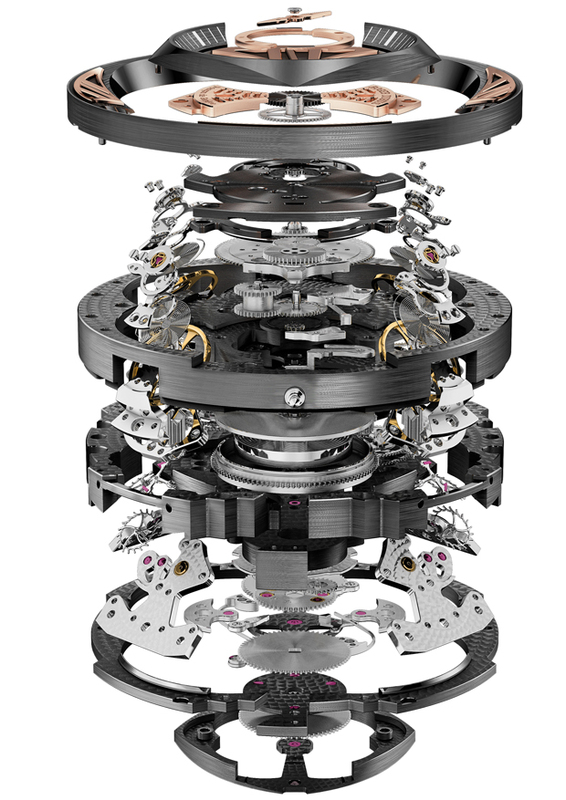 In fact, each balance oscillates four times per second, the frequency of the watch is multiplied by four as the balances do not oscillate simultaneously. You will not hear the ticking of a classic watch but rather a continuous gentle sound. The patent pending power reserve display shows the crescent of the moon turning at the same speed as the barrels - 4.5 revolutions per day- while the needle also turns, but more slowly. As the power reserve reduces, the hand follows the barrels’ rate of discharge, positioning itself precisely on the two moon crescents to indicate the power still in reserve. 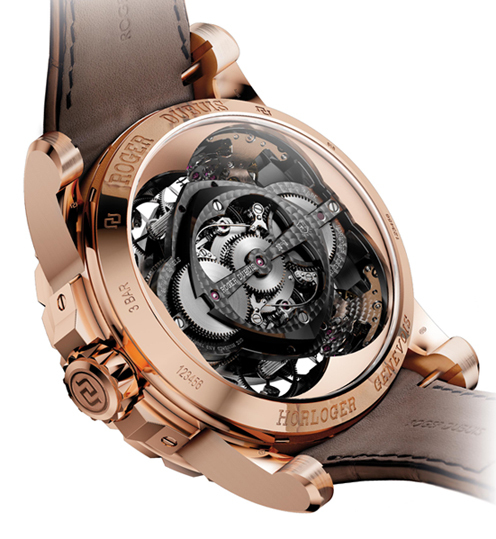 The skeletonized dial with its airy spaces is indeed impressive. 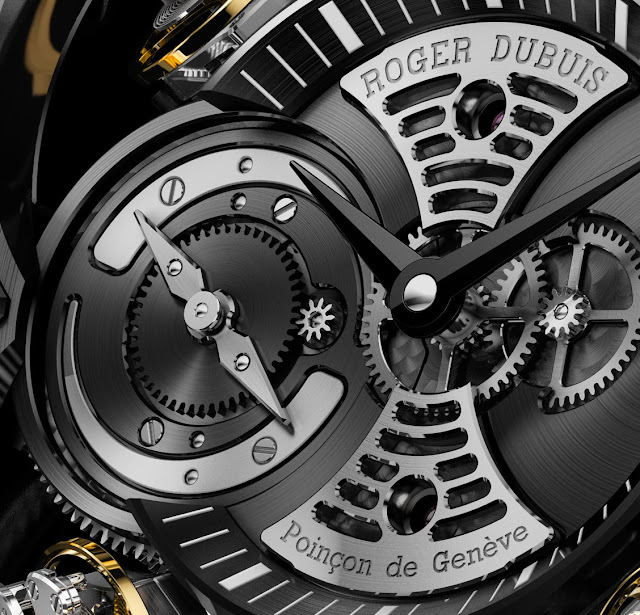 The Excalibur Quatuor watch and its movement are both stamped with the Geneva Seal as every piece produced by Roger Dubuis. Presented at the Salon International de l'Haute Horlogerie 2013 in Geneva, the Excalibur Quator Silicium will be available in just three pieces. 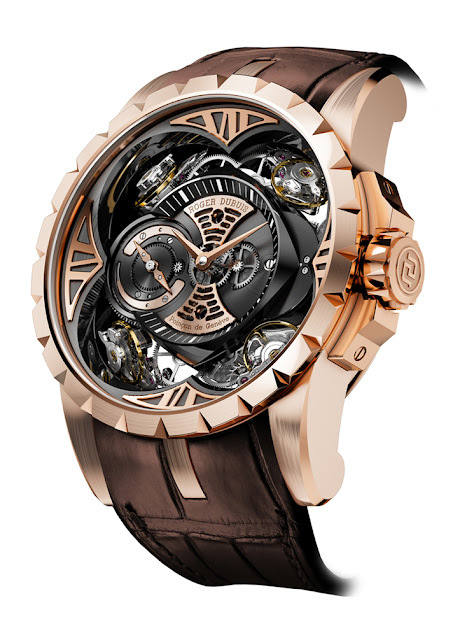 A limited edition of 88 pieces of the Excalibur Quatuor in pink gold will also be available at the price of 350,000 Swiss Francs. Cse diameter is 48 mm.